Beginning in 1993 and continuing to the present, Tech provided air quality monitoring services to the Champion City Recovery construction and demolition transfer station in Brockton, MA, in conjunction with Woodard & Curran. PM10 and PM2.5 levels were monitored over multi-hour timespans at locations near the transfer station to ensure that levels of particulate matter were within the National Ambient Air Quality Standards (NAAQS). Tech Environmental has also performed sound level monitoring at the facility, taking 30-minute measurements near abutters to ensure that noise levels were within the DEP Noise Policy. A construction and demolition station periodically requires assessment of its air quality, fugitive dust emissions, and noise impacts. 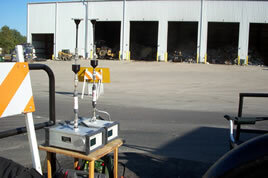 Tech Environmental has monitored air quality, dust, and noise conditions at the facility since 2003.